Long ago, on a normal Thursday, the world went dark. Power grids went down. Electricity shut off. The internet fizzled into nothing. Planes dropped from the sky. People died. One hundred years later the surviving humans live amongst the junk left over from Black Out Thursday. Cars are rusting. Cities lay abandoned. 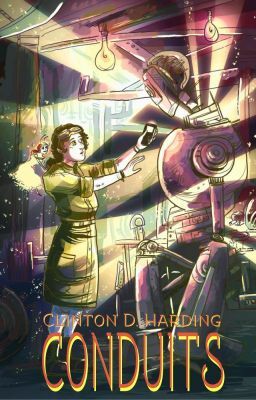 Cell phones, computers, and other machines are worthless to most, except to a few… Clara Danvers is a conduit, a person with the ability to Wake the junk from humanity's past by infusing the sleeping machines with Nites. Fearing the people who do not understand her abilities, Clara and other conduits live their lives in hiding. Most conduits tend to brave the crumbling metropolitan ruins of old, scraping to gather a living for eccentrics who will pay well for antiques from the world's past. They scavenge junk, repair junk, sell junk, and Wake junk in the back allies and dark basements of the lightless communities of tomorrow. Until the day one a conduit goes missing… From a young age conduits are taught to fear those people who don't understand them, to keep vigil, or the road pirates called the Junkers will get them in the night! Braver than most, these bedtime cautionary tales never scared Clara, until the day a friend's family is murdered and that friend's conduit brother disappears. Now Clara must find the people that took her friend's brother. She must do this quickly, because the Junkers are coming for her next… "Conduits" is updated every Tuesday. Check back for new chapters! Thanks for reading! The "Conduits" cover art was created by wonderfully talented Eleanor Ferron. Check out her portfolio by&nbsp;visiting her website at http://eferron.daportfolio.com/.